After a fantstically successful third annual Coney Island Ritual Cabaret Festival, which garnered a "Recommended" from Time Out New York and Metro, ICL is proud to present a documentary about the event. Both trailer and the documentary itself courtesy of Dylan Roth and Corey Montemagno. And you can view the entire playlist of stellar acts on our YouTube channel. Coney Island USA Mainstage, Surf Avenue at 12th Street. The Coney Island Ritual Cabaret Festival marks International Culture Lab's (ICL) third consecutive year probing the fantastical dancing partnership of ritual and entertainment on Coney Island USA's burlesque stage. In March 2017, ICL and CIUSA presented the Coney Island Butoh and Theatre Festival and in March 2016, the Coney Island Butoh and Beyond Festival. 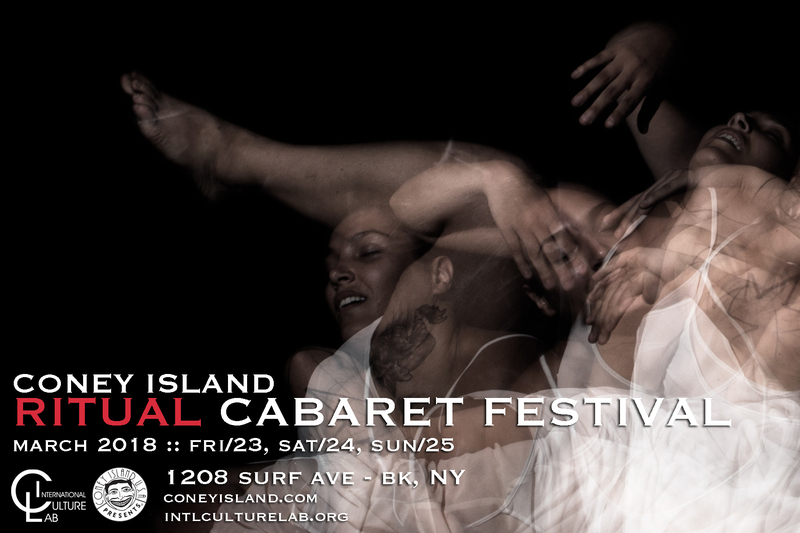 This year ICL, with Brandon Perdomo as co-curator, has assembled an array of performance artists, musicians, and dancers, all of whom have been tasked with presenting original works that define "ritual cabaret" through the lens of their own particular aesthetic, discipline and lineage. Also appearing each night –– coming from his own historical point of inspiration and with his own distinctive approach to sacred entertainment ––is Mexican master teacher Diego Piñón Body Ritual Movement (BRM). Over the past two years, through his intensives and ensemble performances at CIUSA, Piñón invented the term "ritual cabaret" as the defining aesthetic that resulted from his immersion into the historical and contemporary Coney Island. Following up his work at the Eugene O'Neill Theater Center this past summer and an exploratory workshop at CIUSA last October, Piñón now deepens his ensemble's ritual cabaret study with another intensive workshop that will culminate in three unique nightly performances. Cabaret, burlesque, vaudeville, and circus sideshow have had a long and storied history in Coney Island. And for over three decades now, ICL has endeavored to support CIUSA in meeting its mission: "Preserving and championing a set of uniquely American visual and performing art forms, we seek to create an international forum for cultural preservation and discourse, and where Coney Island represents these impulses, we strive to make it once again a center for live art and entrepreneurial spirit." We have now undertaken to merge the two companies' respective focal points in a powerful new way. ICL's exploration of physical theatre began in 2000 with their collaboration with Argentine physical theatre ensembles El Rayo Misterioso and Willaldea where we produced our first Butoh-influenced theatre performance, Ubu Macbeth. In subsequent years, ICL continued their study of Butoh with masters Diego Piñón, Atsushi Takenouchi, Yukio Waguri, Akira Kasai, Su-en, Yumiko Yoshioka, and others. In 2005 and 2007, we helped produce the CAVE New York Butoh Festivals. And in 2006 we produced FridgeFest in Philadelphia, debuting our Butoh-based production Diva Divan, which was reimagined and restaged in 2014 through workshops and performances with Margo Korableva Performance Theatre in Tbilisi, Georgia. The NYC/Tbilisi exploration then led to the ICL and CIUSA production of The Coney Island Butoh and Theatre Festival in March 2016, and the Coney Island Butoh and Beyond Festival in March 2017. March 2018's Coney Island Ritual Cabaret Festival marks ICL's third year in Coney Island with Diego probing the fantastical dancing partnership of ritual and entertainment.